This beautiful girl is Gouda. She's about four years old and a Pitbull mix dog. Gouda is a medium size dog at 52 pounds and I'm betting she'd love to spend some time as a lap dog. You would never be able to tell from Gouda's fun loving, happy go lucky personality that she had a rough start to her life. This girls is very loyal, smart, and very eager to learn. Gouda loves her walks, playtime in the yard, and she is like a puppy when it comes to toys. 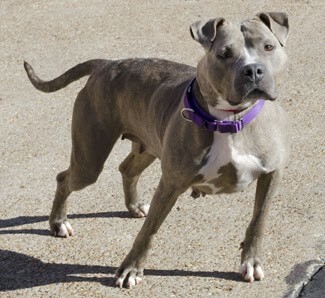 Gouda loves all the attention at the shelter, but she would love to take that next step and find her forever family. I wish she will get a fureverhome soon. Have a great day from Laika. She is a beautiful girl hope she finds a home soon. Sharing. Hope Gouda finds her loving forever home soon.